The Honolulu Museum of Art School offers more than 280 classes and workshops every year for adults and young artists, which are taught by more than 120 instructors and assistants. Who are all these terrific educators? In the coming weeks and months, we’ll take some time to talk with some of them and learn just who they are. 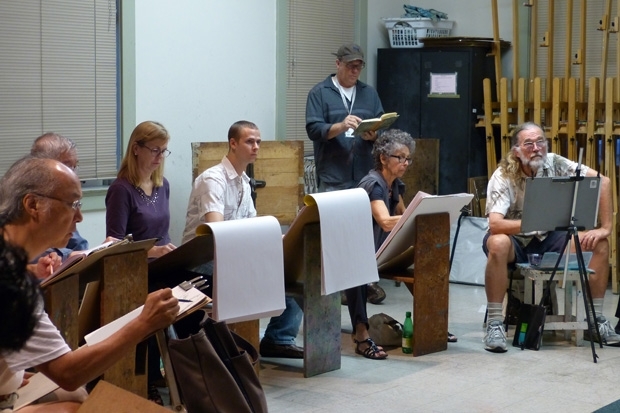 On a recent Thursday evening we visited Mark Norseth’s Life Drawing Studio class, where his students draw from a live model to sharpen their sketching skills. Norseth, who has been teaching at the Art School for eight years, originally hails from Portland, Oregon, with stops in Asia and New York City before landing in Hawai’i. In addition to the Life Drawing class this semester, he teaches Painting and Drawing the Portrait and Sketching the Model “en Plein-Air,” along with The Figure in Watercolor workshop. My interest in art goes all the way back, and my earliest childhood memories include being fascinated by the visual world and drawing. My family caught on to this as well as my early teachers, and as a result I benefited from a lot of encouragement early on. I’m trilingual…a lot of what I do hinges on draughtsmanship, form, and design, and from there it’s worked out via oil painting, soft pastel, or watercolor. I can move comfortably within the three disciplines without too much of a hitch. Each has a unique or inherent attribute, and I suppose I tailor my work to a pairing of the medium to the particular message. I’ve been in the art field as a worker-bee for a couple decades. For reasons both practical and personal, I wanted to connect with like-minded people outside of the marketplace. Teaching fits the bill perfectly. Without question, art making is inherently a solitary and strenuous row to hoe, and establishing regular opportunities each week to get out of my world and share with others is a great blessing to me. I’m around really fine students of all ability levels, and I enjoy working with them immensely. Students in Mark Norseth’s Life Drawing Studio class sketch a live model. Specifically, good models, plenty of information, and time to work. Broadly speaking, I’d say consistency in my approach, and my help in piecing their own art-puzzle together. I want people to fall in love with the process more than the product…when that happens, good work is just around the corner. My classes also have a good feel to the work at hand; we’re somehow lighthearted and very intense simultaneously, which is just how it should be. The good energy in our studio-classroom is something that many of our models notice and comment on. Why do you think art education is important? Briefly? Because we are innately creative as humans, and beauty and our expression of it is every bit as much a necessity to a good life as any other essential. We’ve all read about people locked away from any beauty (for whatever reason) rhapsodizing about a glimpse of the sky or being elated seeing a leaf float by a cell or hospital window. That’s a powerful indicator that we have needs that are not satisfied by the strictly material. Art education provides a doorway to that elusive necessity. What do you hope students will take away from your class? My best answer is satisfaction and insight gleaned from working at something slightly beyond their immediate grasp. I hope that’s not too esoteric, because it’s what keeps people coming back, myself included. What would you tell students who want to take a class but worry they don’t have enough talent? I understand the concern, it’s common, but isn’t what’s important. Here’s what’s important: enjoying the process or “journey” of the work, becoming fascinated by the length, depth, and breadth of it. That’s what makes it worthwhile. If one can get that idea, ironically, the results will take care of themselves. Really. Do you encourage your students to use the museum as inspiration? Yes I do. We need to be influenced by the best, and the real, and it’s a great resource that we are fortunate to have. Rant: Reproductions are not paintings, and we live in a time where flat images electronically viewed are assumed to be the final word in visual reality, which is a pernicious development. I’m not much fun at parties when this issue comes up. What’s your favorite work in the museum collection? Different things at different times, for different reasons! Off the top of my head: the Pierre Bonnard still life, the H. Fantin-Latour floral, and the Childe Hassam ocean piece are all favorites that I always drop in to see. The Latour is a great painting lesson in that the range of treatment, from thinnest paint to the richest impasto, is all there with full value contrasts and a lost/found treatment of edges that I find very appealing. He was also a great arranger…I’m rambling, aren’t I? I also know that there are some Degas drawings tucked away and I hope to have a look at them when we can arrange for it. While he’s not teaching, Mark Norseth might be found painting in one of the museum’s courtyards.